Everything old was new again on the ARIA chart this week in 1989, with a couple of comebacks by artists that had been hugely successful at the start of the decade and the return of a song that'd been a massive hit five years earlier. OK, not everything was old, with another Italo house release making the top 50 and the brand new musical project for a former girl group member. But with the top four dominated by veteran acts and songs, the top 50 was beginning to feel a little long in the tooth. 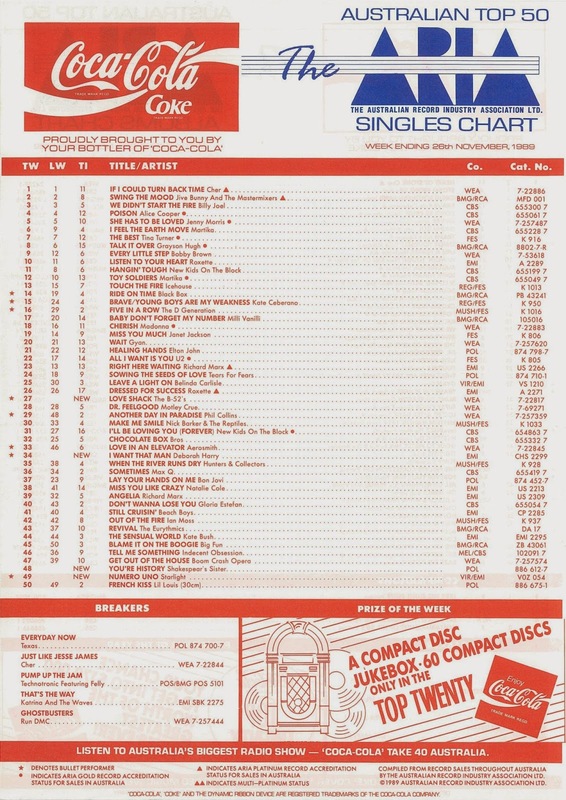 Speaking of the top of the chart, Cher's "If I Could Turn Back Time" held strong at the top of a static top 4, which also included Alice Cooper, Billy Joel and runner-up Jive Bunny & The Mastermixers. The original version of the song reached number 2 and spent a mammoth 21 weeks in the top 10 back in 1984 when the first Ghostbusters film was released, but this revamped version for the sequel by rap trio Run DMC missed the top 50 altogether. Sounding more like something you'd expect from The Fat Boys, the trio's update of the Ray Parker Jr classic did avoid the elements of the original that had resulted in an out-of-court settlement with Huey Lewis & The News (for sounding too similar to "I Want A New Drug"). Lesson learnt, then. The Ghostbusters II soundtrack would produce a bigger hit than this - and we'll see it arrive on the top 50 next week. Last week, we saw perpetual chart misser Debbie Gibson once again fail to crack the top 50 with her latest release - and here was another act who were starting to make a habit of falling short. As it did in the UK, "Everyday Now" made a slight improvement on predecessor "Thrill Has Gone" (which reached number 60 in Australia a couple of months earlier), but not enough to break the one-hit wonder tag Texas would wear for quite a few years to come. Small wonder, since the band's third single was another bland tune that lacked the spark of debut release "I Don't Want A Lover". While "Ride On Time" leapt up to number 14 on this week's chart, another Italo house single masterminded by the same producers (Daniele Davoli, Mirko Limoni and Valerio Semplici) under one of their many aliases bulleted into the top 50. "Numero Uno" wouldn't end up as big a hit as the Black Box single but it did establish that Australia's appetite for dance tracks had increased since the start of the year when club hits by Soul II Soul and Inner City failed to make much of an impression. Bananarama had moved on since the departure of founding member Siobhan Fahey, and now the fruits of her labour away from the girl group found their way onto the chart. "You're History" couldn't have been more different from "I Want You Back", "Nathan Jones" or "Love, Truth And Honesty", which made sense given Siobhan left Bananarama because she was unhappy about the trio's musical direction (thanks to producers Stock Aitken Waterman). Named after a slightly differently spelt song by The Smiths, Shakespear's Sister (the apostrophe was still intact at this stage) had started out as a solo project for Siobhan, and "Break My Heart (You Really) / Heroine" was released as a double A-side debut single. But, one became two when collaborator Marcella Detroit was promoted to regular band member status - and "You're History" established the vocally mismatched pair as a unique force in music. At 44 years of age, Deborah (not Debbie, anymore) Harry ranked as one of pop's elder stateswomen but proved her best days weren't behind her with this lead single from the Def, Dumb & Blonde album - at least in Australia. While "I Want That Man" was a massive hit locally, it didn't even make the Billboard Hot 100 and missed the UK top 10. In fact, in America, Deborah never had a top 40 solo hit - a far cry from all the success she enjoyed as lead singer of Blondie. Written by Thompson Twins' Tom Bailey and Alannah Currie, the song features the line "here comes the 21st century" and, as a result, was one of many songs re-released in time for Y2K to cash in on their lyrical relevance (see also: "1999", "The Final Countdown"). 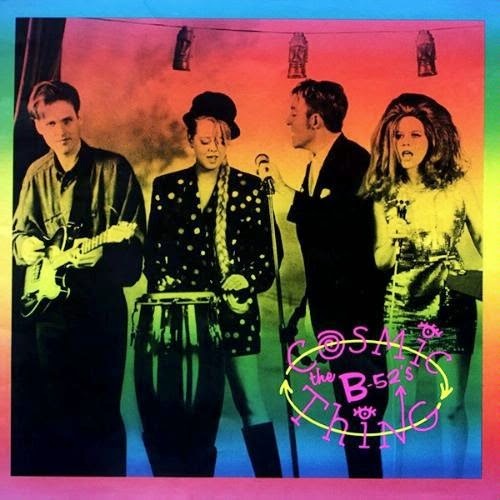 The B-52's had had a rough time of it since their last appearances on the ARIA top 50 back in the early '80s. Musically, they released two less-than-successful albums in the form of Whammy! and Bouncing Off The Satellites, and tragically, founding band member Ricky Wilson passed away in 1985. "Love Shack" changed all that. The second single from 1989's Cosmic Thing album - the first, "Channel Z", would be re-released in 1990 - it was as unique and quirky as earlier hits "Rock Lobster" or "Private Idaho" but thanks to production from Don Was (of Was (Not Was) fame), it was much more commercial than either of those songs. With quotable lyrics like "so hurry up and bring your jukebox money", "hop in my Chrysler, it's as big as a whale and it's about to set sail" and the initially indecipherable "tin roof, rusted", "Love Shack" quickly became the song of summer '89/'90, spending eight weeks at number 1 and entering into the wedding reception/21st birthday party canon. Like "Mickey" and "Come On Eileen", "Love Shack" was almost ruined thanks to being flogged to death, but there's no denying it's a brilliant and totally original song. Next week: the arrival of the aforementioned hit single from Ghostbusters II, another new dance hit and Jive Bunny starts to multiply like, well, you know. Pretty sure I haven't heard the Run DMC track since '89. Surprised it wasn't a bigger hit with the movie tie-in. I didn't realise the original spent so long in the top 10... nearly as long as 'November Rain'. A while back, the wikipedia ARIA Charts page had a list of singles spending ~14 or more weeks in the top 10, and Ray Parker Jr. wasn't one of them... but the list was rather incomplete for singles released before 1988. It was a bit of a surprise to see 'Numero Uno' dent the top 50 at the time, though it took a while to properly 'take off'. I read about Siobhan's new 'solo' project in Smash Hits late the previous year, where they published a couple of pics of her looking rather different to her Bananarama days. Then 'Break My Heart (You Really)/Heroine' was reviewed a little while after that, but I never got to hear it or see it anywhere at the time. A 'friend' at school had taped the episode of the local MTV (which I didn't get to see often) featuring the first airing of 'Break My Heart (You Really)', but didn't want to watch it when I was at his place, so I didn't get to see it... until 2001! I finally got to hear the track in '92 when I bought 'Sacred Heart' after the 2nd album was released. I caught 'You're History' on Countdown Revolution some time in September, and bought the single a few weeks later. Siobhan sounded so different to Bananarama, with the deep voice, that I actually thought Marcella was her at first, and couldn't understand why she featured so infrequently on the song. I did find it equally implausible though that Siobhan had hidden operatic vocal talents all those years, but Marcella *looked* more like the new pics of Siobhan I'd seen in Smash Hits all those months ago, with the short 'bob' hairdo. I had virtually given up hope that 'You're History' would crack the top 50 when it finally entered, as it had been so many weeks since I bought the cassingle. It seems shocking that Debbie/Deborah never had a top 40 solo hit in the US. Surely 'French Kissin'' should have been a hit there, at least. And it's also strange to see so many 'older' acts in the top 50, compared to now. I was also surprised to see 'Love Shack' in the top 50, given the total flop of 'Channel Z', which had aired quite a bit on Countdown Revolution. I like 'Love Shack' (though it's overplayed), but think 'Channel Z' is the far better song... it even fit in with the 'environmentally conscious' theme that was (sort of) fashionable in '89. I ended up buying the 'Love Shack' cassingle, though 'Channel Z' being the b-side (which I found a bit curious at the time, as it was the previous single) influenced my decision to buy it. I know 'Channel Z' got a re-release in 1990 in the UK, but was it re-released here? I don't remember it/wasn't aware of it if it was. I wish Deborah Harry would tour as a solo artist and sing her songs, but I guess it seems the money comes from touring as Blondie. Shocked to hear that 'I Want That Man' didn't even dent the US Top 100. I thought they liked anything that had USA in it? I will always remember this song as being a No.2 hit. I think 'Love Shack' kept it off the top spot for so long. Never heard Run DMC's 'Ghostbusters'. Maybe I'll give it a play here? I thought 'On Our Own' was the only single from the movie. Poor Texas, they really struggled there for a while before they became huge again (well in the UK) in '97-2000.